JJ Murphy’s has been around for a while, located on Cuba St, however it’s only recently that I’ve gone in there for the first time. I was pleased to find that not only does JJ Murphy’s have quite a large, dark interior with a good atmosphere, it also has a massive menu of solid meal options, including a couple vegetarian options such as their spinach lasagne. 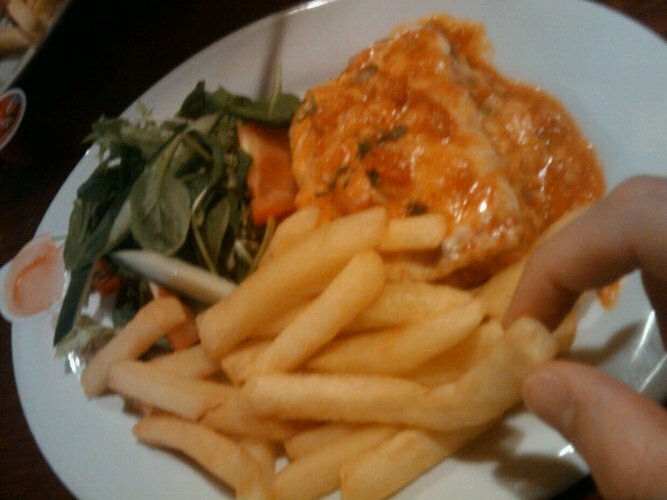 I was pretty impressed, the above picture doesn’t really do it justice – chips were well done, a decent salad was provided and the lasagne was solid and covered with plenty of delicious cheese and sauce. One of the issues I’ve found with some vegetarian lasagnes is that they don’t use particularly tasty cheese (looking at *you* wishbone!) so without the meat, they lack any real good flavour, but this one was just excellent. I’d recommend it and certain be back for more in future. According to my flatmate their coffee was pretty decent, and it seems they have a cheap breakfast special for $6 for both meat eaters and vegetarians, so I might have to pop back to try that out too. This entry was posted in Uncategorized and tagged bars, food, opinions, reviews, vegetarian, wellington. Bookmark the permalink.